While we revealed full details about the new flagship of Moonen some months ago, we can announce that Sofia (YN 194) successfully hit the water earlier this month. As a reminder, Sofia is a 41.78m semi-explorer type motor yacht built in steel and aluminium and designed by Stolk Marimecs and René van der Velden. The designers had carefully developed this project with a repeat owner. A good example is the stern, which was especially designed to carry a submarine with three passengers. The interior, designed by Art-Line, accommodates 10 guests in five cabins: a full-beam master on the main deck, two double and two twins on the lower deck, plus crew quarters for seven. Lloyd's classed and MCA compliant, Sofia is powered by twin 746kW Caterpillar engines giving a top speed of 14.5 knots, a cruising speed of 12 knots and an interesting range of 5,000 nautical miles at 9 knots. 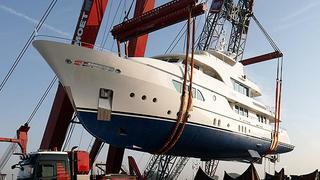 Sofia, the third superyacht with this name, is scheduled for delivery before the end of the year.